Alrighty! The last garment I made for last week's Kid's Clothes Week. 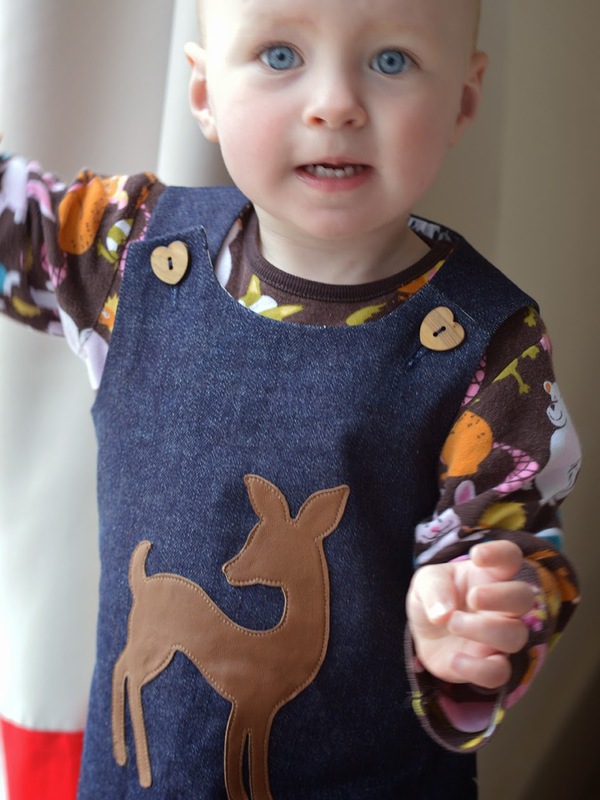 Taking the 'Wild Things' theme in a slightly calmer direction than the two leopard print garments, here's a little denim pinafore dress with leather fawn appliqué and galloping horses on the facings. 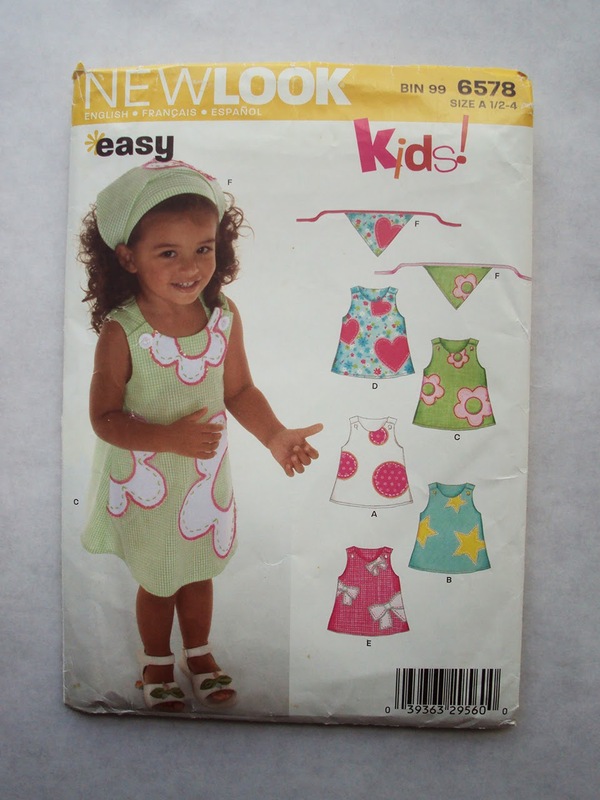 Remember the pile of awesome children's sewing patterns I was given last year? 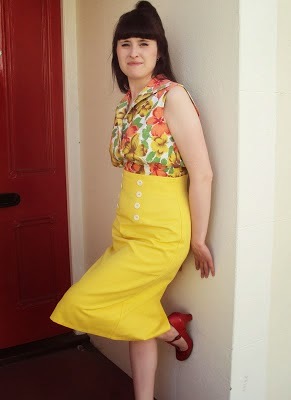 This pinafore pattern (Newlook 6578, pictured below) was amongst them, given to me by lovely Adey from The Sew Convert. This pattern has been playing on my mind since I received it, it looks like such a useful (as well as quick!) potential project that could work in many different fabrics. So having actually used it, I can definitely confirm that it is both a quick and a simple make. In fact, the pattern includes some appliqué shapes and a stupid head-triangle in an attempt to make it look a bit trickier! 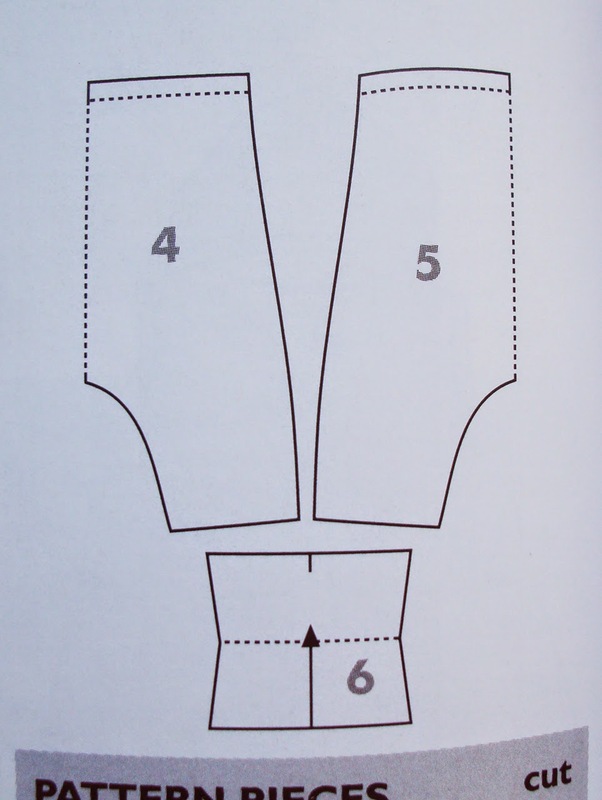 My copy of the pattern was still factory folded when I opened it up, so all sizes were in tact. I traced the size 2. I'm sure you'll be bored of me saying this by now but I have to: this garment came out a bit big for Dolores to wear right now, but that was my aim as I want her to get full use from it. The only thing the pattern didn't call for which I probably would do next time is to stitch a row of topstitching/edge-stitching all around the top and along the straps. Not that there's anything stopping me from adding it to this version, aside from my own laziness! I think I may have made a bit of a mistake here. I used some more of the slightly stretchy denim that I'd also made my denim sweet shorts fail from. I thought the stretch in the denim might make it more comfortable to wear, but I fear the fabric is a bit too thick. The shape sticks out a bit like a lampshade, but I'm hoping that will be less apparent when she is a bit bigger and fills it out more. The appliqué, however, I am super pleased with. I have a small stash of leather samples that were given to me by Claire from Sew Incidentally (how generous is the sewing community?!). I believe she rescued them from a bin at work! 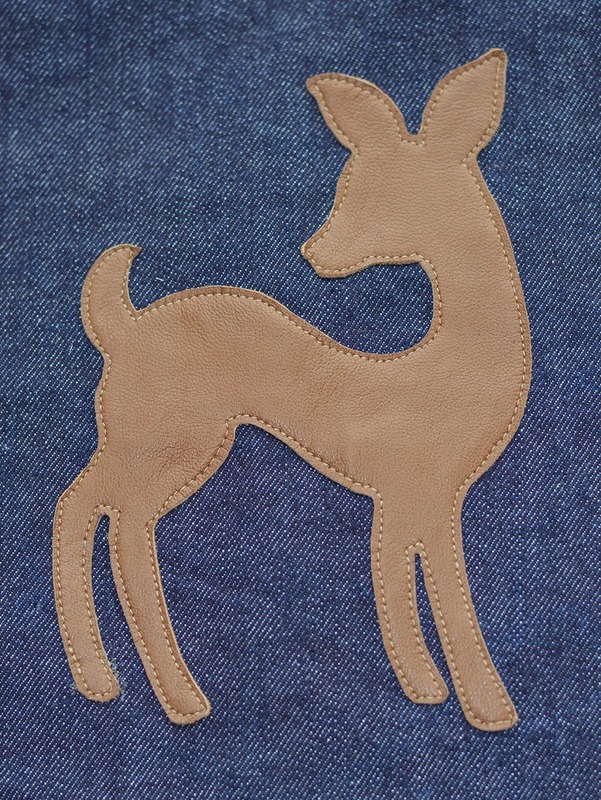 I've had this fawn outline print out since I worked at Traid where I used to do appliquéing from time to time, but hadn't used this particular design before. I think this appliqué works perfectly for children's wear: it's a cute addition, but not too girly when cut out of leather. I used a fancy new foot on my sewing machine to make sewing leather easier, but I'll write about that in more detail when I review some sewing machine feet in a post that will publish in June. I'm also very happy with the choice of fabric for the facings. This light-weight horse print cotton used to be part of a dress that was donated to me by my friend Umi. There was a massive rip under one arm that would have been extremely difficult to mend so it got assigned to the cutting up pile instead. Umi's dress was really tiny and the style was comprised of panels so it was tricky to harvest much fabric from it, so children's wear it was destined to be! I think these facings look great in this print. 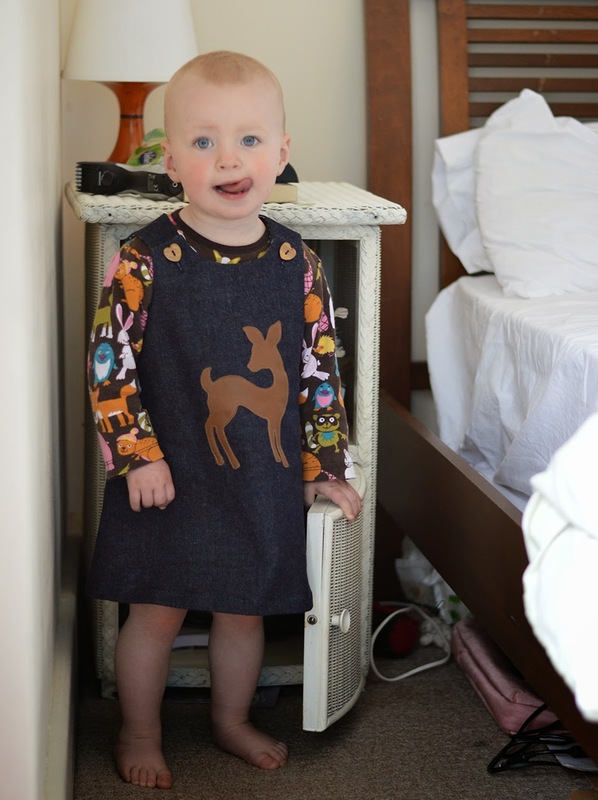 I'm really glad to have found such a great pinafore pattern and I intend to make a stack of these over the next few years (the pattern goes up to size 4). 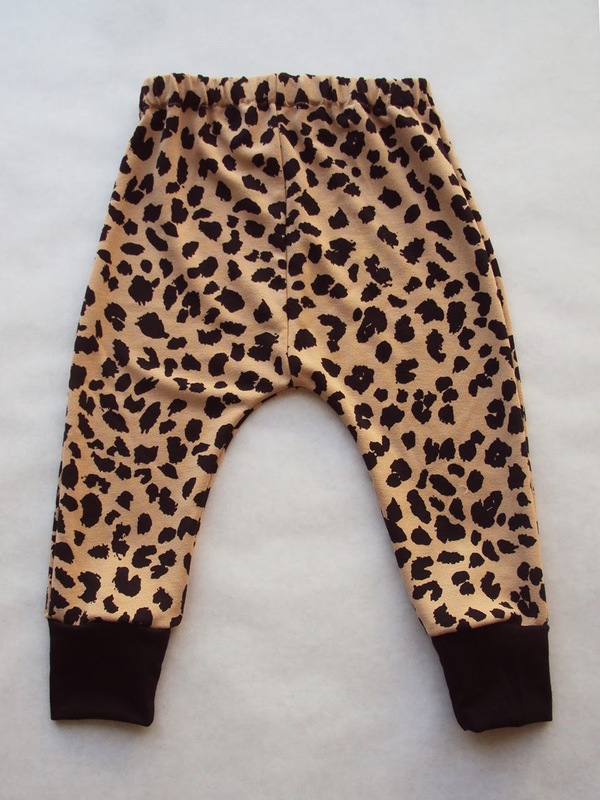 They will be great for layering with vests, t-shirts, tights and cardigans. Plus the basic shape is a fabulous canvas for all sorts of creative use of appliqués or applied pockets, or for playing with details like a scalloped hem. 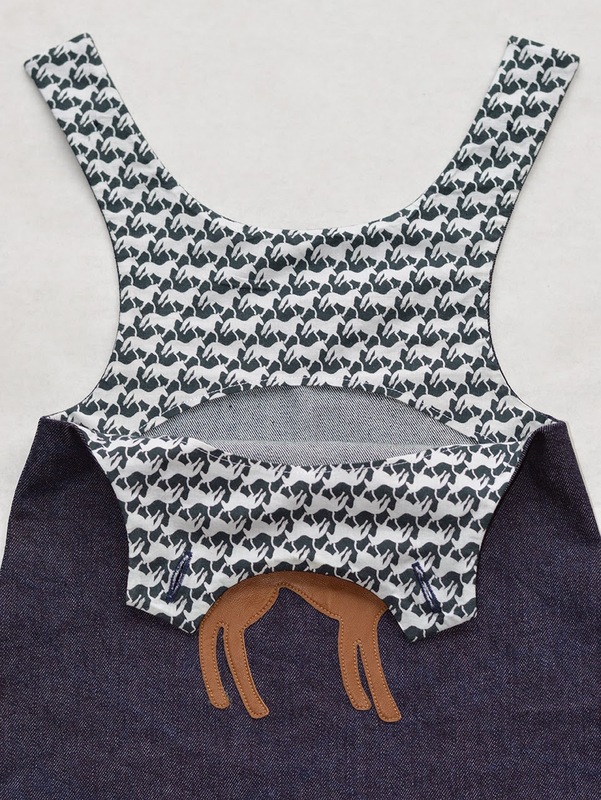 Do you have any ideas how this pinafore pattern could be jazzed up? My poor choice of fabric is a bit annoying though. It made for easy appliquéing but the sticky-outiness of the overall shape looks a bit silly. I'm still going to put her in it though, and I'm hoping that it'll soften after several wears and washes with fabric conditioner. It's be great to watch how other participants of KCW (Kid's Clothes Week) have interpreted the 'Wild Things' theme. You can see their daily blog posts here which highlights some of the awesome creations hat have been rolling in to the project page of the community-only section of their site. From a 'claw-ripped' T-shirt, to a wild-flower adorned swimming costume and animal-print fabric galore, it's been a real feast of sewing inspiration. 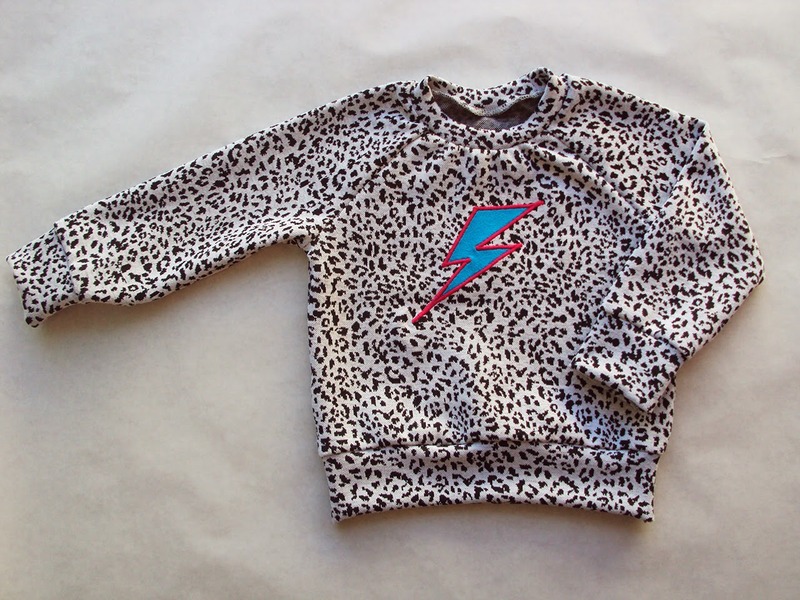 For this sweatshirt, I took the 'Wild Things' theme in a punk-rock direction. 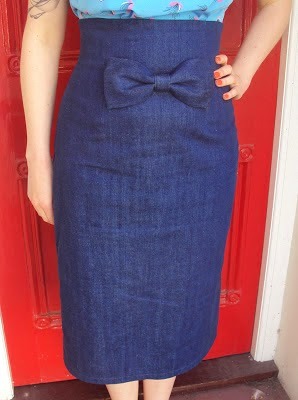 I've got the appliqué bug at the moment because I love how a simple addition and completely transform a basic garment. The lightning flash on leopard print reflects the crazier side of Dolores's nature. 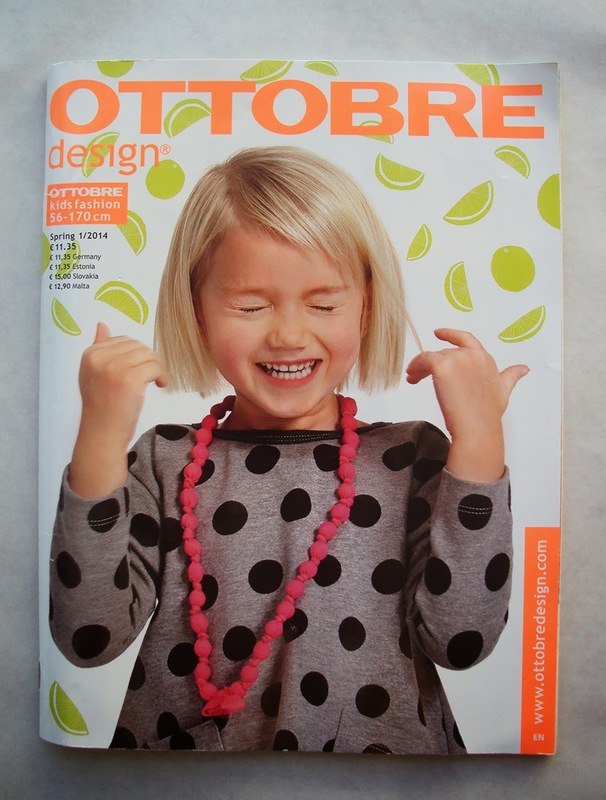 I know I've mentioned Ottobre magazines a squillion times before on this blog, but for kid's knit sewing patterns they really the shiz. The Spring 1/2014 edition is one of the ones that contains sooo many I want to try, including this Totem Owl raglan sleeve sweatshirt. I traced the smallest size (86), thinking it'll fit her during the Autumn/Winter, which I think is a fair estimate considering how it fits her at the moment. Taking into account that this version is currently too big for her, I found the fit of this pattern to be much baggier than I was hoping for. I thought this might be a staple sweatshirt pattern that I could use many times going forwards, but I don't this will be The One. The neck binding was also far too tight for the neck hole, and yes I have checked that I added the required seam allowance so I'm confident that it's not my fault on this occasion! The neckline binding, waist binding and cuffs are meant to be cut from ribbing, but this double knit has a lot of width-ways stretch so I don't think the self-binding is to blame. I made this top pictured above over four years ago and have literally worn it to death. Holes had started to appear on the cuffs, side seams and at both elbows. 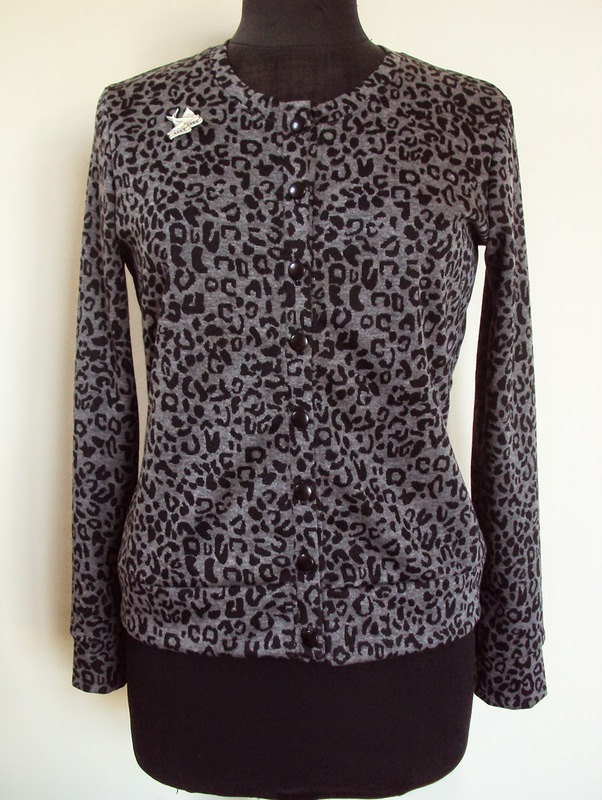 Made from a super soft leopard print ponte double knit, I think it was such a successful garment because the T-shirt style was easy to wear and to layer, but felt much warmer than if it'd been made in jersey so was great throughout autumn, winter and spring. 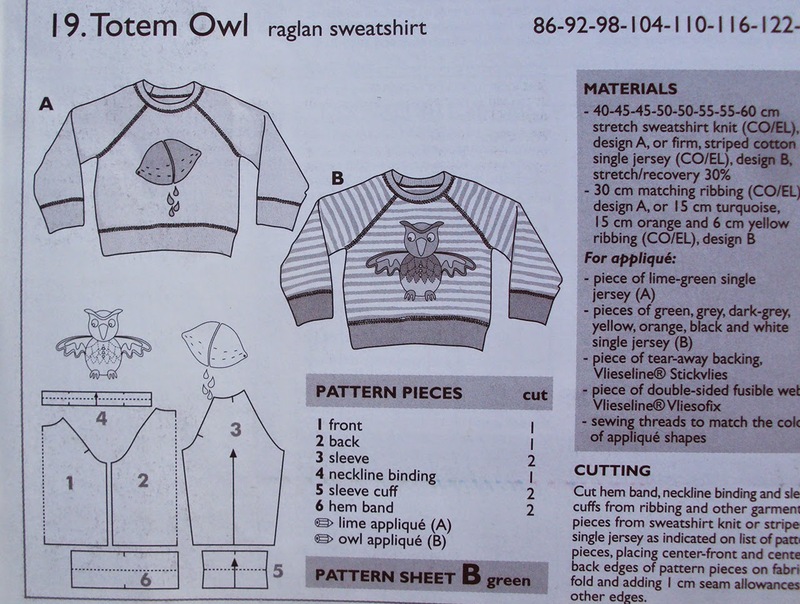 I wanted to squeeze any remaining life left into a new incarnation, and just about managed to cut the Totem Owl sweatshirt pieces whilst avoiding the worn out and thinning parts. The pattern unsurprisingly called for sweatshirt fabric, but I think this double knit will feel nicer and allow for more movement in such a small garment. 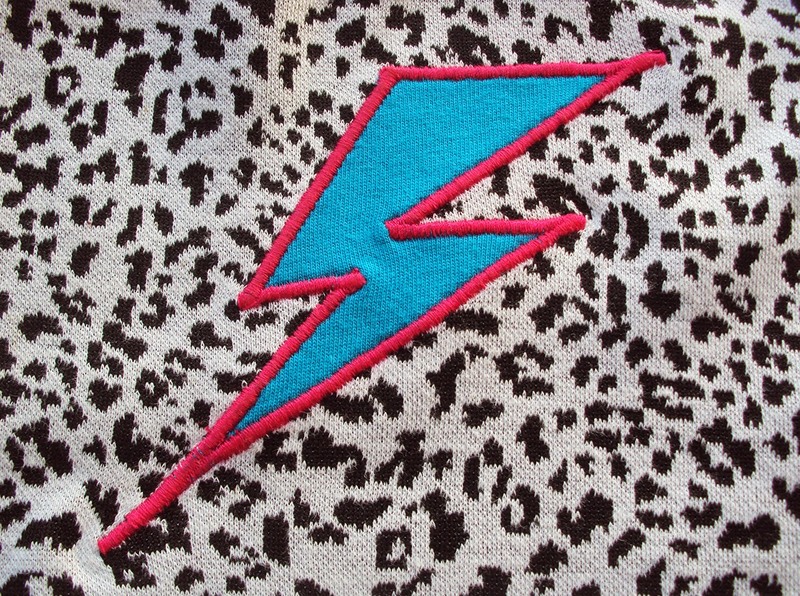 The lightning flash appliqué was cut from a scrap of t-shirt jersey and satin-stitched round the edge using my sewing machine set to a zigzag stitch (width 4, length 0.2, I think). I secured the lightning flash in place with bondaweb and fused some interfacing around the area on the back. As I say, I'm a little disappointed with this garment. The fit isn't what I was aiming for (but I doubt I'll be arsed to try tweaking the it) and the neckline is a bit too tight and gathered in by the band being too small. I don't have any more of the fabric so can't cut a new one, and it's just about ok for her to wear as is. I think I'll resume my hunt for the perfect sweatshirt pattern. Possibly I'll give Brindille and Twig's a try. Having said that, this sweatshirt is getting a lot of love from friends who have seen the pic at the top of this post, and I do love how the appliqué has turned out, it really pops. I'll have to see if she seems to enjoy wearing it later in the year. Maybe the fit won't bother me by then. What do you think? Have you found time to be a great healer in such sewing-related circumstances?! 'This year, I decided to step up my pledge for Me-Made-May, endeavoring to wear only garments I’ve made, altered, or repaired, for the month (excepting only my raincoat). This undertaking turned out to have some unexpected consequences right away, and got me thinking about how challenges like MMM push me to advance my wardrobe and my style, and to present my best self to the world. As May drew closer and I started to consider my summer clothes and what I could and couldn’t wear under these new rules, a few unexpected me-made wardrobe gaps came to my attention, including the fact that I lacked any kind of me-made top I’d want to sleep in. At first, I admit I was a little annoyed. I didn’t really feel like reorganizing my list of things to sew and putting a new pajama top next in line, and sewing one didn’t seem that exciting or necessary. After all, the old RTW tank top I was sleeping in was totally fine, even if was kind of ratty, faded, pretty much all recovery worn out of the fabric, and starting to develop a little hole or two … actually, once I considered, it was nothing like what I’d really like to wear or the image of myself I’d like the world (or even my husband) to see. In fact, lately I’d started throwing on something else over it if anyone other than Bryan was likely to see me wearing it. So, I would make a new sleep top for sure, but what should it be like? 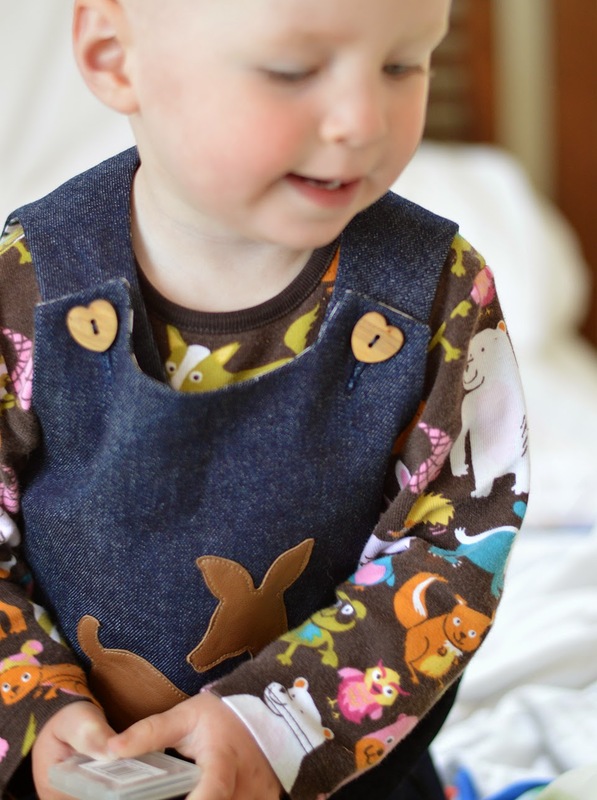 I had a little time before we would be home and I could sew, so I let ideas roll around in my head as they appeared, and considered options on and off for several days as I was falling asleep. What would my ideal summer sleep top be like? I would have limited time to make it once we got home, so I needed to match a fabric and pattern from my mental inventory of what was already in my stash with my ideas of what the top should be like. 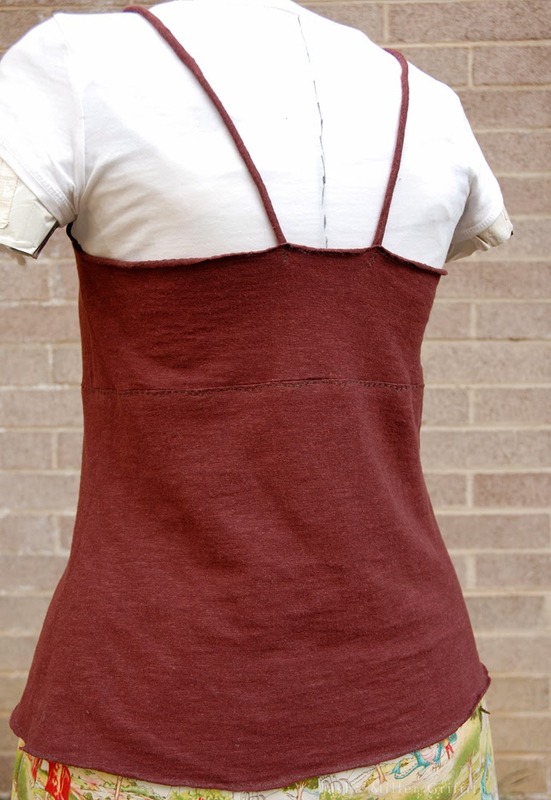 After a while I settled on using one of my all-time favorite cami/tank patterns (copied from a RTW top), with some slightly slubby organic cotton knit I got at Bolt Fabrics in Portland a couple of years ago, and had made one top from already. This would be my first time using this pattern with a knit, but I figured I could leave out any closure in the back and worry less about seam finishes, take it in a little if necessary, and it would be extra comfy for sleep. The cups of this design with their little pleats, and the scalloped edges (which the original top had, so that option usually occurs to me when I think about this pattern), combined with the fabric, would give me the look I wanted: feminine and a little romantic, while still fit for public viewing. We’re usually on the road for part of May, and lucky enough to have friends and family to stay with, so pajamas which I don’t mind wearing into someone else’s kitchen to make tea in the morning are a definite plus. The actual experience of making this top turned out to be better than I first thought too. Of course there’s the tactile experience of sewing anything, which I love. 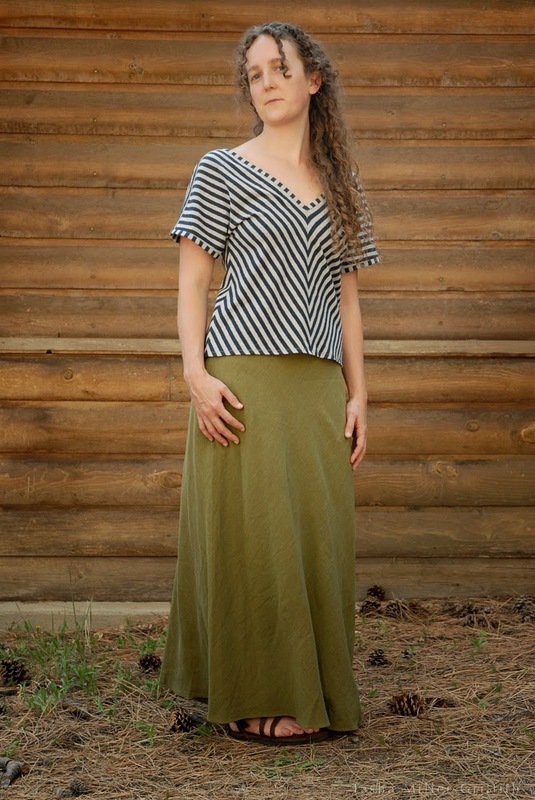 But this top also gave me a chance to try out a couple of experiments with one of my favorite patterns, and the wheels in my head started turning with ideas about design, shaping, fit and fabric. (In case you’re curious, I ended up pinching out about ½” at the top underarm seam on each side, and leaving the rest as it was). 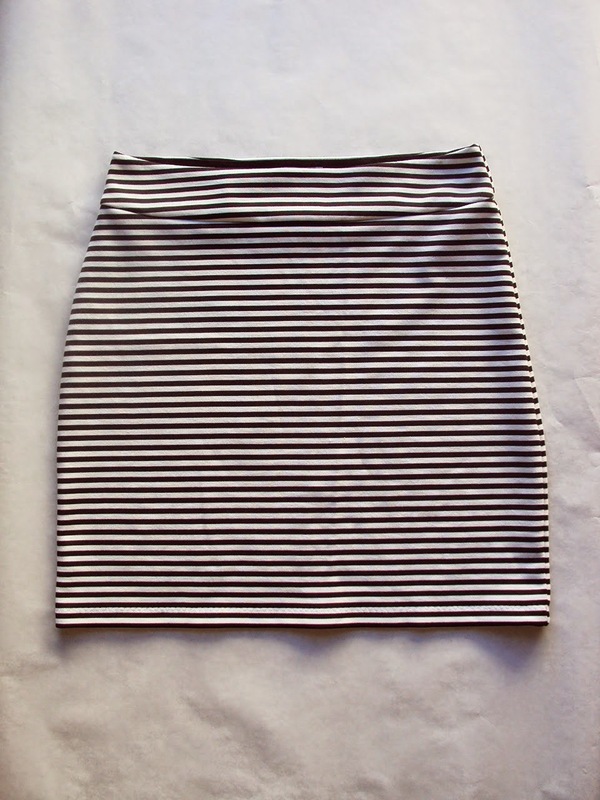 A single layer of knit fabric made for easy finishing with just a row of slightly scalloped decorative stitching, and the pleats kept it from being too revealing in front. 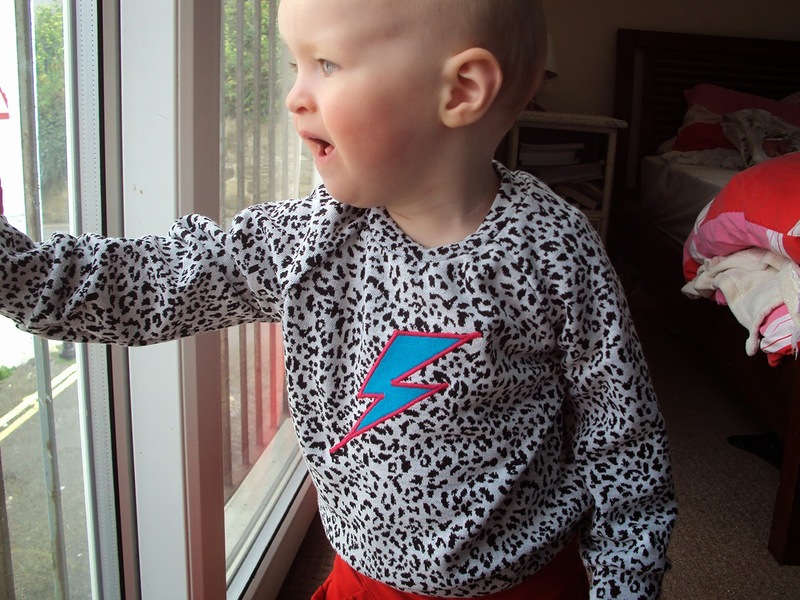 This week (20th - 26th April) I'm taking part in the Kids Clothes Week sewing challenge (as I explained here). I've taken part in two KCW challenges previously, and at the end of each of those I published a summary post sharing all the things I made during those weeks. I then wrote more detailed posts for each of the garments I made afterwards. This time I'm switching things around: I'm going to write individual posts for the garments I make as I go, and then write a summary post next week. I'm doing this for pretty boring blog post scheduling reasons; I've got a lot of posts I want to share on the run up to and throughout Me-Made-May. So anyway, let's get on with why we're here: I made a frikkin' garment. 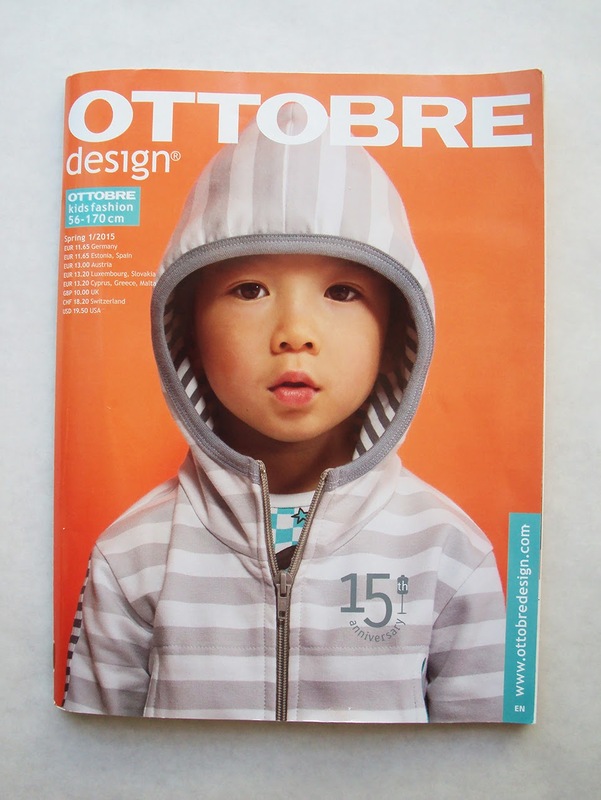 I've talked about how awesome Ottobre magazine is many times before. I have seven issues, and four of those are proving particularly useful, my most recent acquisition, the Spring 1/2015 issue (pictured below) being one of them. I like to put Dolores in garments made from knit fabric so she can scamp around unimpeded. I've made sooo many pairs of the Playful Kitty leggings that it's ridiculous (and now getting a bit boring to make them), so I've been keeping my eyes peeled for a knit-trouser pattern variation. 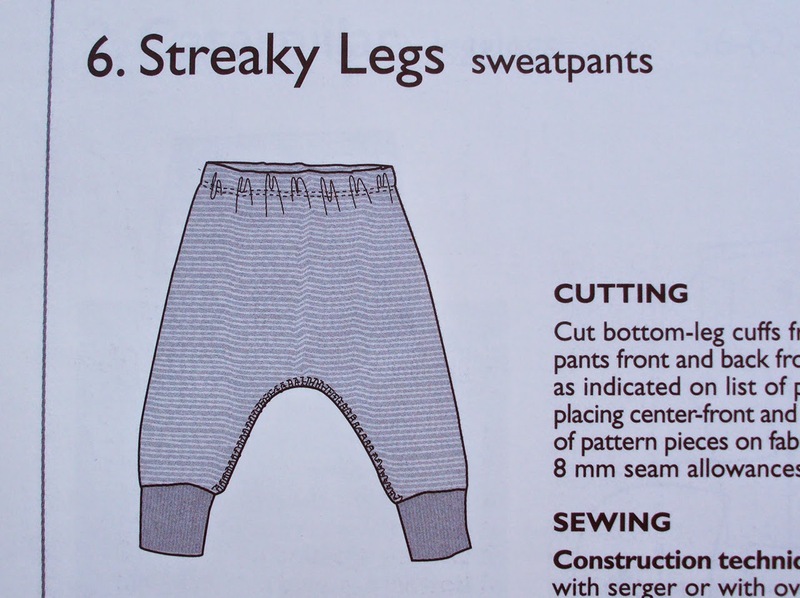 The streaky legs sweatpants pattern (pictured below) looked like a fun alternative to leggings: nice and roomy for playing in and certainly spacious enough to accommodate a nappy! 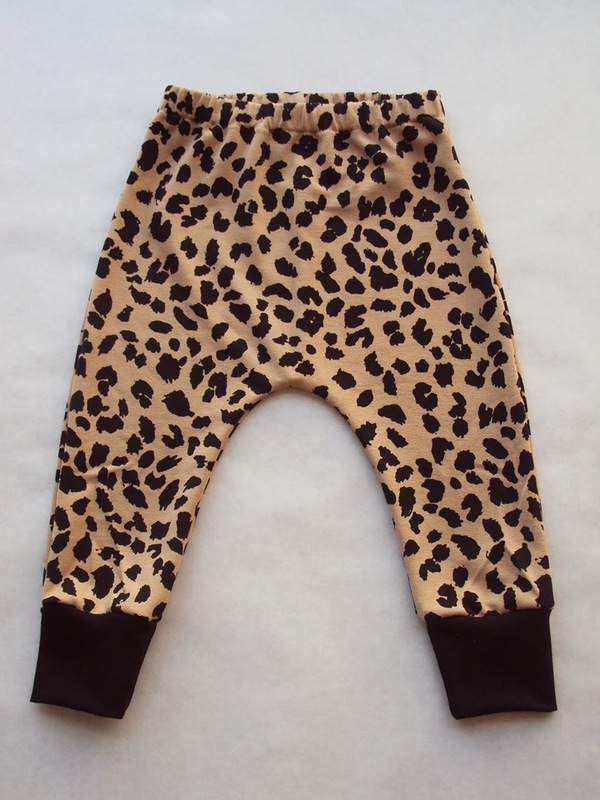 The pattern consists of three pieces, a whole two pieces more than the Playful Kitty leggings pattern (! ), but I tried not to let that put more off! It's still a crazy simple garment project: a front cut on the fold, a back cut on the fold (although mine has a seam running down the centre back because of fabric limitation) and a pair of ankle cuffs. If I had to find a negative about this pattern, I'd say it isn't the most efficient child's trousers pattern ever, in terms of fabric usage. 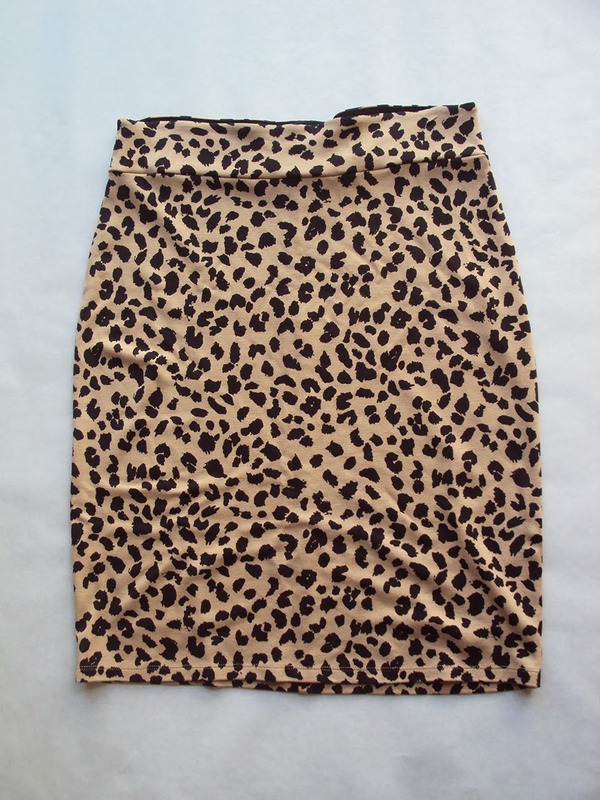 I'd consider making a centre back seam in other versions in the future, like this leopard print pair has (see below), except the centre back seam was made for me in this case as it existed in the original skirt that I made these from. Dolores is a bit of a skinny-malinx, so I combined sizes: size 80 for the width, and 86 for the length. They are currently a bit big for her, but I'm pleased with that as I want her to get maximum use from them. I constructed them entirely in my overlocker, omitting the (IMO weird) topstitching detail that's meant to go round the crotch seam. The only bit that my regular sewing machine got involved in was stitching the casing to feed the elastic through. I recently got a new sewing machine that can do stitches I hadn't previously tried before, so I used a lightening flash stitch (which is really narrow but has more stretch-ability than a normal straight stitch) and was really pleased with the result. 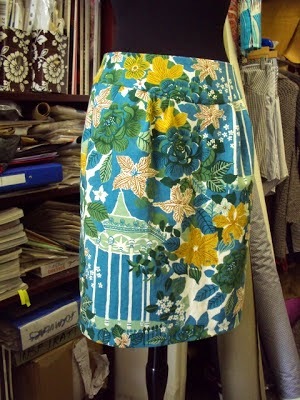 Normally I stitch my elastic round the waist with a three-step zigzag. That stitch has lots of stretch but because the stitch goes through the actual elastic, the waist size can't be adjusted at a later date without an epic unpicking session. I'll definitely use the lightening flash/elastic tunnel method again. You know me, almost always stash-bustin' or refashioning where possible. And this project was no exception. I bought a large knit pencil skirt from a charity shop towards the end of last year with the intention of remaking it for myself. 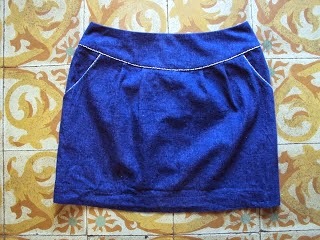 The original skirt was more or less a knee-length tube with an elasticated waist. I used the Colette patterns Mabel skirt pattern (see here for my conclusions on that), but I wasn't particularly happy with the outcome. Although pretty thick, the fabric was much more drapey than the striped fabric of my other Mabel version/s and the leopard Mabel came out wayyyy too big. By that point I was pretty much over the Mabel skirt pattern, so stashed the skirt away to remake into something for Dolores. 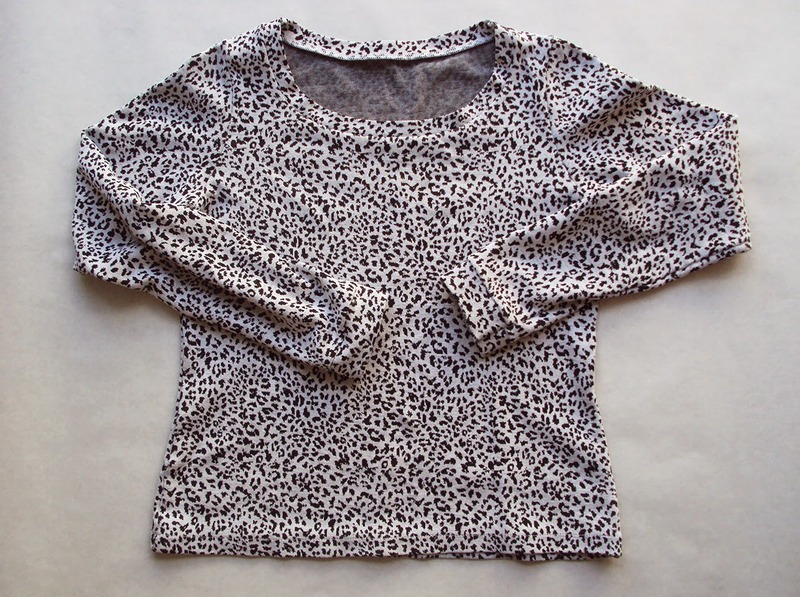 As I say, this leopard knit fabric is actually really drapey. 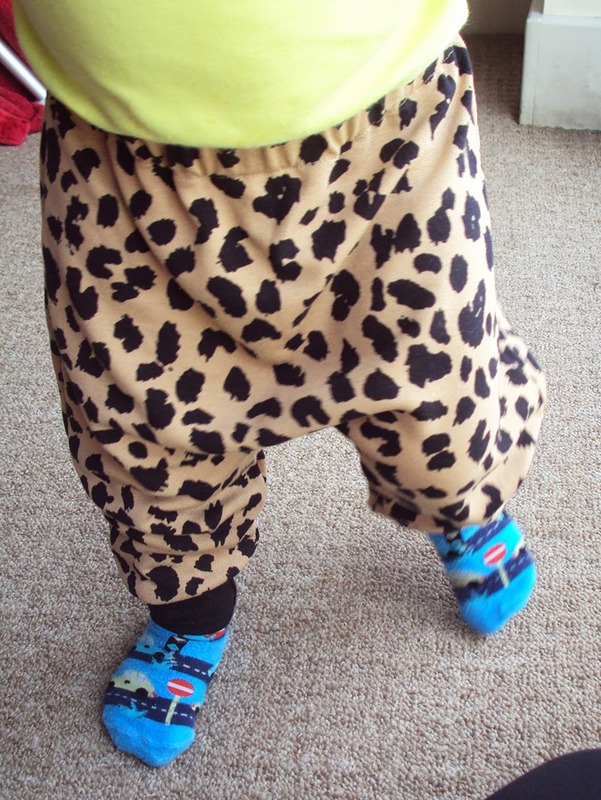 The streaky legs sweatpants pattern calls for sweatshirt fabric, but I think this floppy leopard stuff gives the pattern quite a harem pants type look. The leopard skirt wasn't big enough to cut the front, back and cuffs from it, so the cuffs ended up being cut from a small piece of black jersey that I had left over from a big piece that became many other garments (including my black Dolores batwing tunic and 3/4 length sleeved Bronte top). I'd like to make this sweatpants/trousers pattern again in something thicker and more sturdy like sweatshirting for the winter, but I wonder if they'd be as comfy and if a thicker fabric would feel really bulky between the legs due to the dropped crotch style. As you can see from the picture above, Dolores wasn't quite sure about them initialy! I put them on her and she kind of stared at them for a while, I guess trying to figure out what was going on down there. She seemed to get over them fairly quickly though and got on with her usual high levels of busy-ness. And me? I love them! I'm super pleased that a charity shop score that was then turned into a FAIL eventually became a fun and wearable garment. It'll take a few 'proper' wears (rather than this little test/modelling sesh) to see if this style really is functional, or if the bagginess around the crotch creates some problems, like when she's strapped into her pushchair perhaps. 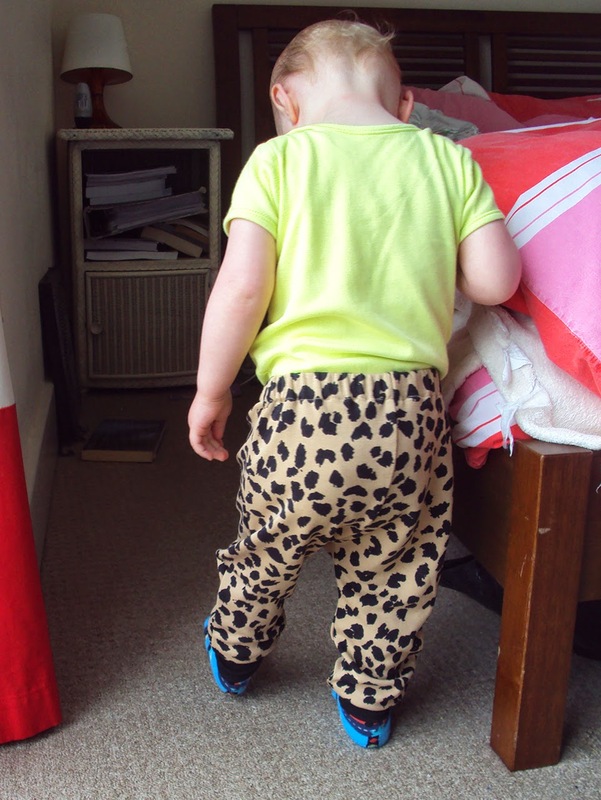 Does anyone else have any experience of putting their kids in this style of trousers? Any problems caused by the dropped crotch? Using the forth-coming Me-Made-May challenge as a catalyst, I finally got round to doing something I've been wanting to do for ages: make a cardigan. I wear cardigans ALL THE TIME, usually secondhand fine knit type ones. I would love to start introducing some handmade ones in there as well because A) I want to have made as much of my own clothing as possible, and B) I hate relying on shops, even charity shops, for any particular type of garment because the joy of having complete design control is hard to give up once you've tasted it! The first ever self-made cardigan I had was the infamous Saint cardigan (RIP) which saw soooo much wear in its lifetime. 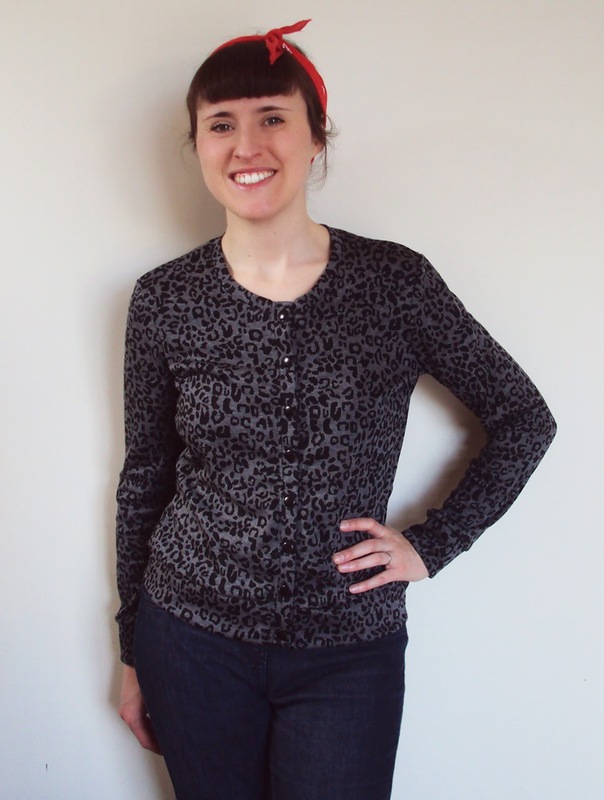 Back in 2010 I self-drafted that pattern because at the time there weren't any great cut-and-sew cardigan patterns out there. If the Jenna pattern had been available then, I probably wouldn't have bothered, so I was forced to exercise my pattern making skills despite my lazy nature! Returning to 2015: rather than referring back to my pattern cutting skillz to come up with a new cardigan pattern, I wanted to have the thinking done for me this time. I already owned the Julia cardigan pattern from participating in Perfect Pattern Parcel #6's blog tour, which I went as far as printing out and sticking together. I then stopped to google other people's experiences of the pattern to help me decide which size to cut out. Looking at the images of many of the versions out there, I started to feel that perhaps it wasn't really 'me', and therefore a risky choice for the rather precious piece of fabric I planned to use. I'm pretty sure I'll use that pattern at some point, but at this stage, the search for a great cardi pattern resumed. It didn't take me long to think of the Jenna cardi pattern. A quick google search brought up many many versions, ALL of which I loved. We had a winner! Style options: It was difficult to decide which combo of features to make; do I go for hip or waist length, plain or gathered yoke shoulders, full-length or 3/4-length sleeves? It's still bloody cold and damp here at the moment, and my fabric is on the thicker end of what would be suitable for this pattern, so I decided to go for the most coverage: hip length with full length sleeves. I adore the gathered yoke shoulder detail variation included in this pattern, but I thought it might not be very noticeable with a fabric that has a busy design, so I promised myself that I'll try that option next time and keep things plain for now. For this version I cut the size 36 which related most closely to my measurements. 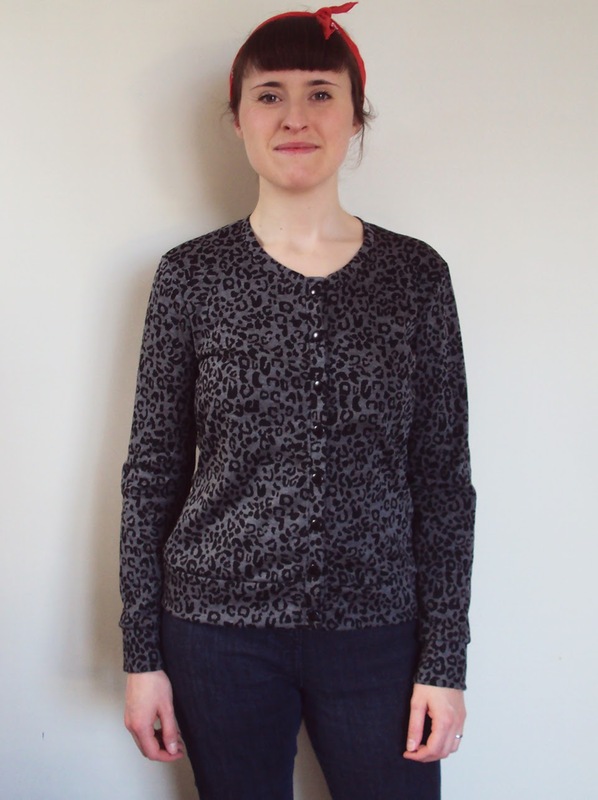 I found that the shoulders were way too broad, it kind of looked more like a jacket than a cardigan, so I shaved off some of the armscye with my overlocker. 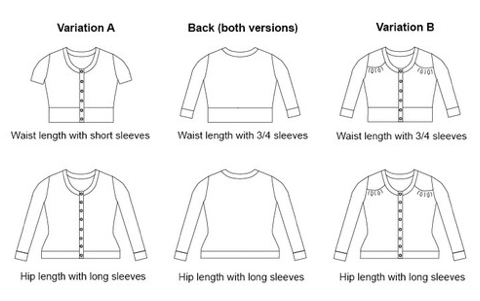 Next time I think I'll actually blend between the size 34 for above the bust (including the sleeve) and the size 36 for below the bust, as the rest of the fit is pretty spot on time terms of dimensions. The jacket-effect was exemplified by how wide the sleeves came out. I pinched out and shaved 2 cm off the sleeve width (so about 4 cm in total per sleeve) from the cuff to about level with the elbow. Next time, as mentioned above, I'll start with the size 34 sleeve and then see if further width needs to be removed depending on my choice of fabric for the next version. The sleeves were comically long. Well, actually they weren't but they would have been. This is because I tried on the work-in-progree to check the fit before the cuff bands were added, and at that point I could easily have just hemmed the sleeves and called it done because they were so long. However, I really like the look of cuff bands, so I removed 6 cm from the sleeve length before adding them. I didn't make this alteration on this first version, but I think there's something a bit extreme and angle-y about the side seam shaping, particularly where it meets the waist band. I'll address that by smoothing that curve and angle out a bit going forwards. I also might make a really boxy version at some point that has little-to-no shaping around the waist at all. Ah, cutting into this fabric was hard! It's been languishing in my stash for about three years, having scored it second hand. It was almost as precious to me as the striped stuff that became my 1960's Breton top and equally difficult to know what to do with. Spurred on by the success after finally using the stripy stuff, I felt it was probably also time to set this one 'free'! I'm pretty sure this fabric was some kind of sample length, but it didn't come with any kind of label or tag so I have no idea what it is comprised of. 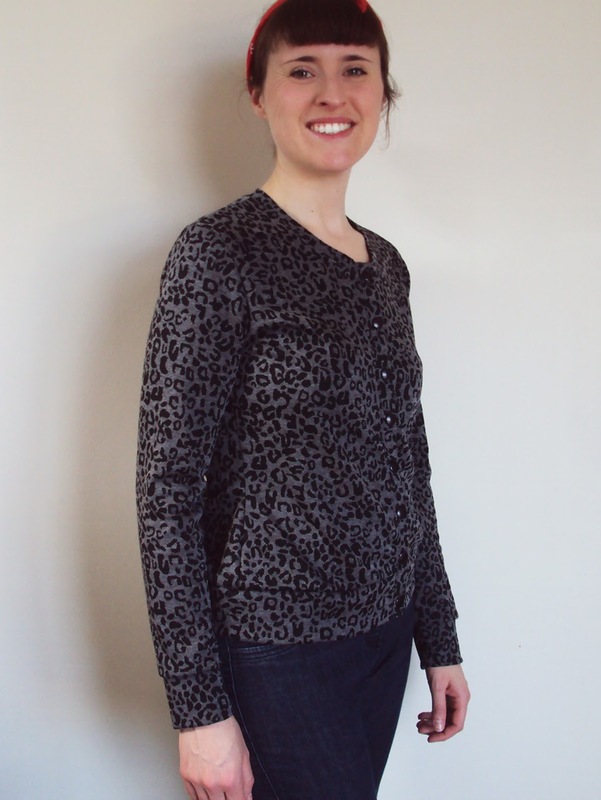 I do know that it's some kind of stable double-knit with a woven-in (rather than printed) leopard print design and has a really lovely, soft feel. This fabric could have become many things, but seeing as I wear cardigans every day it made so much sense to use it for that purpose. It would be a real shame to make this fabric into a garment that doesn't get worn hardly ever so it isn't enjoyed to the fullest. I haven't worn this cardigan yet but I'm pleased to have it in my arsenal. Me-Made-May will help me figure out how to incorporate it into my current wardrobe and which outfits I feel it works best in. I'm excited to use this pattern again, and my head is brimming with ideas for it, like adding piping round the shoulder yoke when I make that version, or making a must wider button stand to use some of the epic larger buttons in my stash. 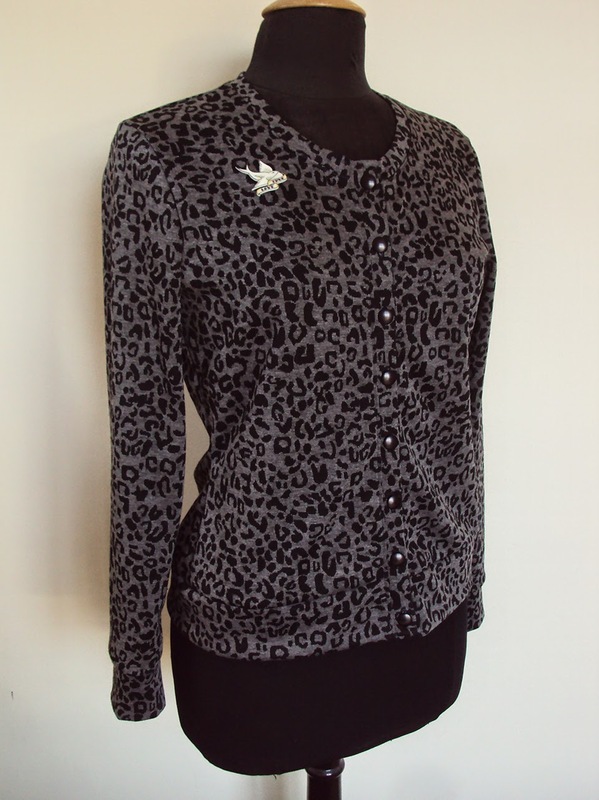 Boringly, I had to buy the plain back buttons that feature on this leopard print version, as I don't have many sets of eight or more buttons. 'I, Zoe of 'So, Zo... What Do You Know? ', sign up as a participant of Me-Made-May '15. I endeavour to wear as many me-made garments as possible each day for the duration of May 2015. Plus I will wear a skirt or dress five days per week'. There, I did it. I will permit myself to wear some of my secondhand cardigans sparingly (because so far I only have one self-made cardigan which I'll blog about in a few days time). I won't permit myself to wear my secondhand jeans or jeggings because I want to get out of the wardrobe rut I've found myself in by following the daily formula of: jeans/jeggings + knit top + cardigan. Pushing myself to make more use of my skirts and dresses is going to be tough, because I don't tend to feel as comfortable in them as I do in jeans. I'm hoping I can come up with different ways to wear my skirt and dress selection that will change how I feel in them. I don't want to own any items of clothing that don't get at least a few wears each year (very special and very seasonal garments being the exceptions), so I need to find ways to incorporate them into regular rotation or I'll have to part with them and stop myself from making more! 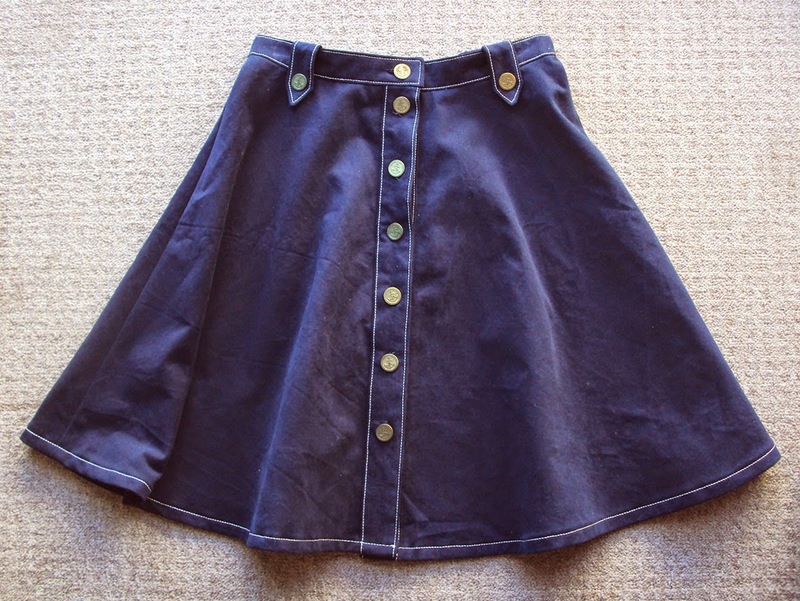 I was pretty brutal recently and got rid of some skirts that, even though I had a bit of sentimental attachment to them. I have no regrets and I'm now left with only six skirts (all of which are pictured in this post). To go with my skirts and dresses, I did consider making some tights using Marilla's tights pattern, but a recent sort out of my undies drawer unearthed a squillion pairs of tights already so it wouldn't be a good use of my limited sewing time at this point. The challenge will generally be a great opportunity to dig out some hidden me-mades and try to find out why they don't get worn very often, and if there's anything I can do about that. I'm really excited to get going and make this a valuable challenge. I've really enjoyed reading each pledge as they've pinged into my inbox. If you are taking part, or planning to take part, did you/are you finding it difficult to come up with a useful pledge to challenge yourself with? 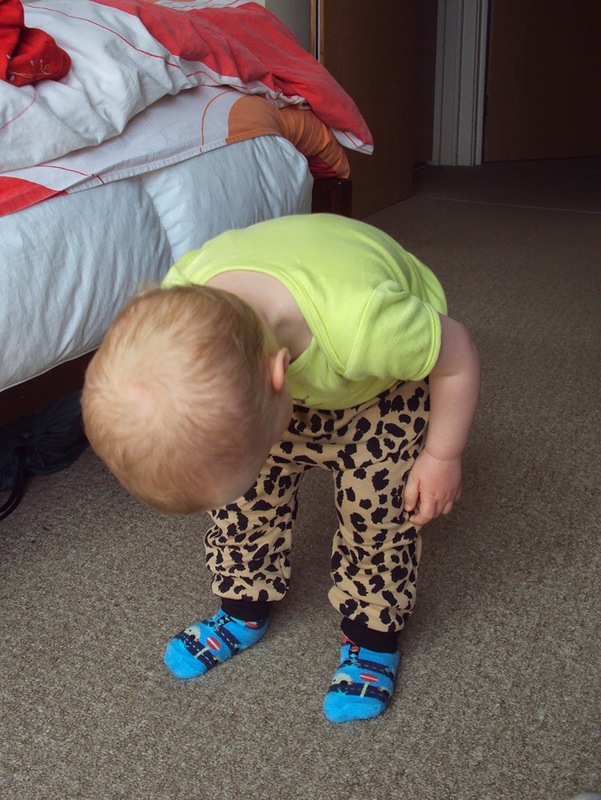 Kid's Clothes Week Sewalong April 2015: Wild Things! 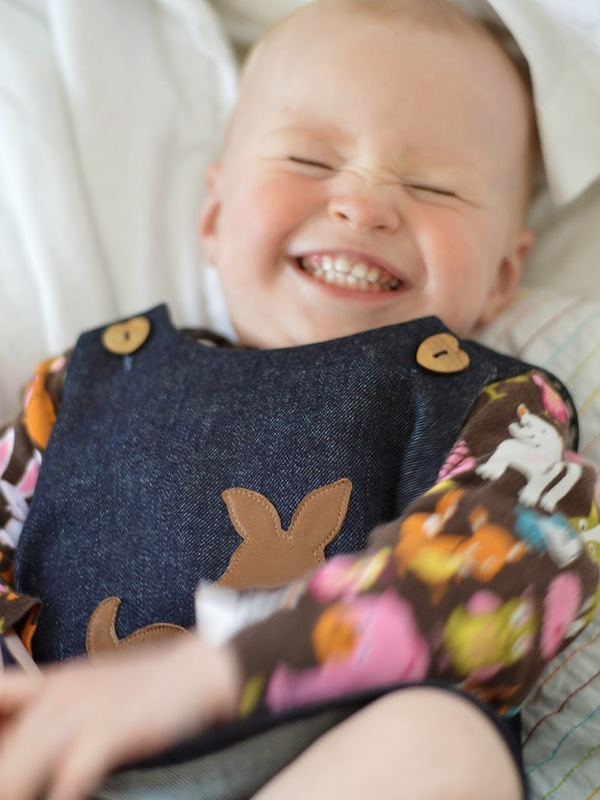 Second only to Me-Made-May, Kid's Clothes Week (KCW) is now firmly my favourite sewing community occasion! For me, I find it's a great way to actually get round to creating some of the squillions of projects that I carry round in my head. I really like this season's theme and intend to follow it, although I'm pretty sure it's not compulsory to do so. 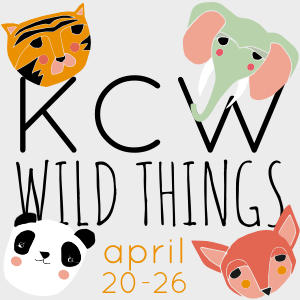 'Wild Things' could be taken in so many directions and I'm excited to see how the rest of the KCW community interpret it. 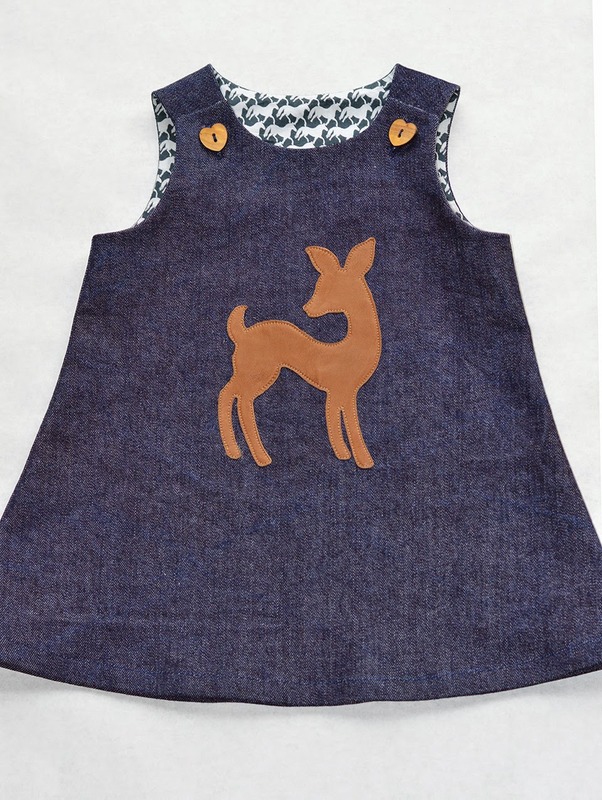 This post on their blog in particular has some wonderfully inventive ways to incorporate aspects of animals into wearable children's clothing. Also, I think this is a great theme because it's likely to get the children themselves really engaged in what they are having made for them. 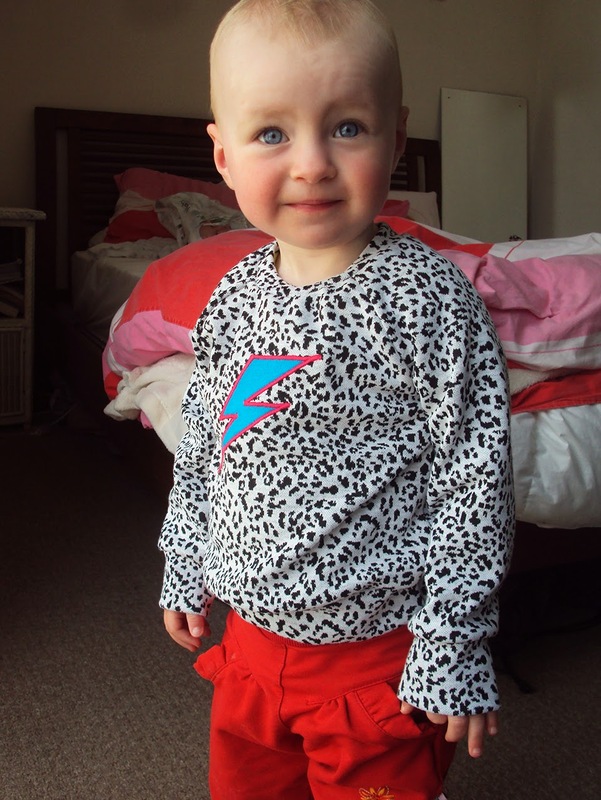 My eighteen-month-old, Dolores, has just started pointing at and naming animals, and has started noticing the dogs printed on her pyjamas, for example. As much as I obviously adored the Upcycling KCW challenge, I think this one has more scope for making fun for the kids themselves. Personally, I've already got a few projects planned that I'm hoping to complete by sewing for at least one hour per day between 20th - 26th April. I've been doing some prep, like tracing pattern pieces and even doing some cutting out, so I've got more chance of getting the sewing completed by the end of the week. I'm taking the theme in a couple of directions, and I'm excited to show you what I come up with!